Remember how Kanani looked when she came here from Ebay? Dry wig, smudge marks on her face, lipstick traces, misapplied people makeup on her face? It was obvious she could be rescued, but she required a lot of work. 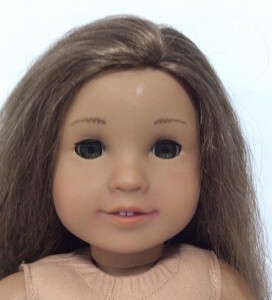 After her arrival, I managed to get rid of most of the smudge marks on her face and entirely remove the extra makeup and applied copious amounts of braid spray to her hair. While her hair was less ratty than it was when she came here, it was still pretty dry in comparison to the dolls I’d bought new. I got fed up with her dry hair and ended up cutting it just past her shoulders. I was still disappointed in how dry her hair still was even after applying braid spray multiple times for several months. I also didn’t want to bother with Downy Dunking — I don’t have the time, patience or space. 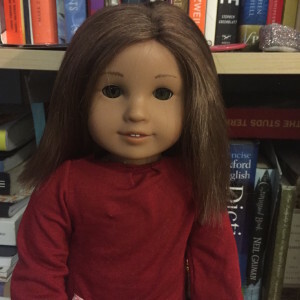 I decided to rewig her instead–this is what she looks like now! 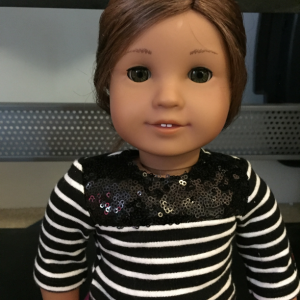 GoodDaySunshine at American Girl Collectors sent me a spare Marie-Grace wig this week after I’d asked about good alternative wigs for Kanani. It turns out the wig was a really close colour match; both Marie-Grace and Kanani have honey-brown hair with blonde streaks. The main difference is that Kanani’s wig is a bit curlier out of the box, whereas Marie-Grace’s just has the slight curl at the end. Marie-Grace’s hairstyle (at least without the pincurls) is much easier to manage for me than Kanani’s out-of-the-box style; I have a hard enough time with Caroline’s hair. The rewigging wasn’t that difficult; I was able to get off the old wig with the pointed end of a screwdriver and a pair of scissors (I didn’t want to keep the old wig anyway; it was too dry). I then glued the new wig on and gave her a subtle side part as opposed to the centre part Marie-Grace would have had. 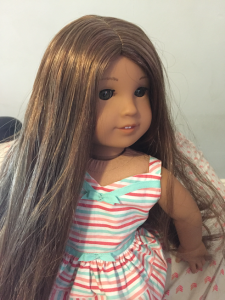 Kanani is my second custom and my third rewig.